Esther Minars – daughter of Holocaust survivors, wife, mother, grandmother and genealogist – was given the opportunity to document her mother’s wartime survival. In transcribing verbal testimony to book form, she has engaged deeply with historical records and studied how such awful events played out over the years of Nazi rule. The memories recorded are of a vibrant pre-war Jewish Lublin life extinguished forever and for her mother Eva, survival against all odds. So relates the memoir of a young woman, Eva Szek (later Eisenkeit), who survived the Nazi onslaught against Jews in her beloved city of Lublin in Poland, an important centre of Jewish religion and culture. Eva recounts with compelling testimony her fearless fight not to fall into German hands and to save her family. Her experiences under German occupation, her struggle to survive and her subsequent liberation is an historical account of the tragedy of a Jewish community destroyed. The memoir describes Jewish Lublin life before the war, its religious institutions and charities; Polish-Jewish relations; the German bombing and invasion; the Russian escape options; the German occupation and registration of Jews; Eva's escape from the ghetto and two labour camps; her hiding in villages and farms, and complex wartime relations with Poles; her negotiated freedom with Mr. X (a Polish man who hid Jews for money, and cannot be considered a “Righteous”); life in liberated Lublin, including the first Passover celebration; meeting other survivors and trying to make a living; and Eva’s postwar move to Lodz and marriage, and then to a Displaced Persons (DP) camp in Germany. 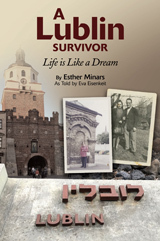 As her eighty-fifth birthday approached, Eva asked her daughter Esther to take down her life story “so the whole world will know what the Germans did.” A Lublin Survivor: Life is Like a Dream not only provides an extraordinarily complete and descriptive picture of life in pre-war and liberated Lublin but a first-hand account of the obliteration of its Jewish community and one individual's indomitable determination to survive against all odds. The fact that we can read this book is miraculous. It is personal history on par with the Diary of Anne Frank and Night by Elie Wiesel. Eva describes her life in Lublin before the war. You can smell their fresh baked bread. … I later found myself mourning for the people she described. The second describes her life following the German invasion. It was gripping. I could not put it down. The final third, describes her life after liberation by the Russians, and it is equally gripping. Although she had been liberated, her misery was not over. No one was left. Eva’s story will remain one of the most memorable books I have ever read.